Jinnah, the founder of Pakistan, has a mystical presence for many of his followers, and nowhere is it depicted better than in the mainstream Pakistani films, especially those made by the adherents of the Film Arts school of thought. By these I mean Waheed Murad, Pervez Malik, Nazrul Islam and some other filmmakers from Pakistan. 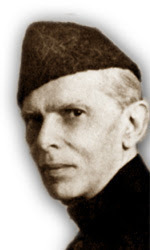 It is customary to hang a portrait of Jinnah in Pakistani offices and educational institutions. Hence, most public offices in films were depicted with Jinnah’s portrait hanging in the background. Clever filmmakers knew how to make good use of this convention. Pervez Malik, whose films were invariably parables about the collective life of the nation, usually managed to bring a portrait of Jinnah in those scenes which pointed at the real theme of his movies. For instance, Sachai (1975) is a parable about the quest for truth in a society where dishonesty seems to prevail. “As long as this picture hangs above me, I cannot flinch from doing my duty,” says an impassioned officer in that movie. Since Jinnah was known to be a person who never told a lie in all his life, his portrait becomes a thematic icon in this movie whose title means Truth (or Truthfulness). Another clever example can be seen in Aina (1977), the most popular of all Pakistani films. An angry rich man wants to stop his daughter from marrying a hotel clerk, and tries to enlist a police officer for that cause. “Find some law which could prevent them,” says the father. The police man replies curtly, “There is no such law. Go to the parliament because that is where laws are made, not here.” The founding father overlooks this conversation through a portrait in which he is looking into the camera very knowingly. A very unusual instance comes from Jaal (1972), a film produced by Waheed Murad. At the climax of the film the villain gets exposed as the ultimate source of crime in society. Just before committing suicide in the courtroom, he looks at the judge who is busy writing the verdict, and then at the portrait of Jinnah hanging above on the wall behind the judge. For a moment there is an eye contact with the face in the portrait, and then the villain ends his own life. Hence Jinnah becomes the guiding spirit who is still overseeing the country founded by him. this is a fantastic post khurram! wonderful and really worth reading. but something about today as well. even poor will want to accommodate that photograph?